Dr Pantea Foroudi (PhD, MSc, MA, BA) is Programme Leader (MA, e-Marketing and Social Media) and Lecturer in Marketing and Branding at The Middlesex Business School. Prior to joining Middlesex in August 2015, she was Senior Lecturer in Business Management and Undergraduate Course Director at The Claude Littner Business School, University of West London. She also has held academic positions at London International College of Business and Technology (LIBT), Brunel University London and lecturer at Azad University and Al-Zahra University, Tehran, IRAN. 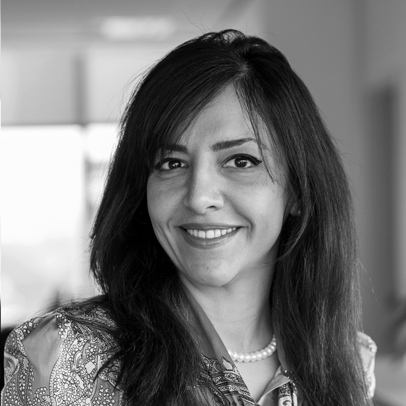 In addition, Pantea has several years of experience of working in marketing, design, advertising and market research firms and has conducted research projects in UK, Dubai and Iran. Pantea is currently teaching Social Media and e-Marketing to postgraduate students and international Marketing to undergraduate students. In the past she has taught Public Relations, Corporate Marketing Strategy, Marketing Research, Marketing Principles, Foundation of Marketing, Marketing Planning, Business Management, Enterprise and Business Development, Managing Small Medium Enterprise, and Corporate Advertising and Media. She received Special Recognition Award. Pantea's major research interest is in Marketing, Branding, Communications, Visual Identity/Design, and Social Media and e-Marketing from a Multi-Disciplinary approach. She supervises PhD students in field of Marketing, Branding, Design, and Corporate Identity. She has published in the Journal of Business research, European Journal of Marketing, and Qualitative Market Research. Pantea is Ad-HOC reviewer in various Journals such as Journal of Business research, European Journal of Marketing, Qualitative Market Research, and Industrial Marketing Research. She is the first translator of Photoshop III Book to Farsi in 1997 and published Persian Hairpins Book in 2001 in Persian language. Photoshop 3: The first translation from English to Farsi (1997) Chap and Enteshar Publication, Tehran, Iran. Persian Hairpins (2001) Chap and Enteshar Publication, Tehran, Iran. Foroudi, P., Melewar, T. C., and Gupta, S. (2014). Linking corporate logo, corporate image, and reputation: An examination of consumer perceptions in the financial setting. Journal of Business Research, 67(11), 2269-2281.